Ryan Gravenberch (16) had just turned 8 years old when he joined the Ajax academy. 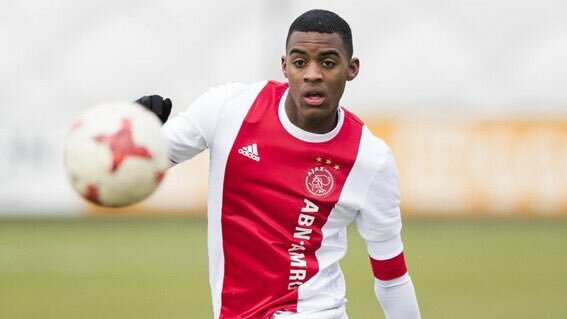 Before joining Ajax, he played for Zeeburgia, one of the clubs who delivers a lot of young players [U8-U12] to professional football clubs. Ajax has a partnership with the club, and every year a few of their talents join Ajax. Examples from recent years include Timothy Fosu-Mensah, Juan Familia-Castillo and Kenny Tete. After Ryan’s first few years in the academy, he was promoted to older teams quite quickly, a process that has continued until this day. He made his debut for Ajax U17 when he was 14 years old, he impressed with his performances and was fully promoted to the U17’s in January 2017. After the following summer, Ryan made his U19-debut already and once more he showed his class in good performances. In the meantime, he became Ajax U17’s captain and played his games for both Ajax U17 and Ajax U19. When he played for the U19’s, he did get the opportunity to show himself more and more on a bigger stage. Even though it sounds unbelievable, he played more and more in the U19s and with success: his performances earned him a promotion to the highest academy team, led by coach John Heitinga, in january 2018. And if this wasn’t enough, he earned himself a professional contract on his 16th birthday as well. On this same day, he was named ‘Talent van de Toekomst’, the annual prize for most developed talent. He received the first Abdelhak Nouri Award [since last summer, the ‘Talent van de Toekomst’ prize has been named after Abdelhak Nouri] from the Nouri family. After a short break, Ryan was allowed to attend the first team’s pre-season in Amsterdam as well as the training camp in Germany and England. In August 2018, he made his professional debut. He became the youngest ever debutant for Ajax U21, since they are playing in the Dutch First Division [Jupiler League and now Keuken Kampioen Divisie]. After the summer he was fully promoted to the U21’s. Gravenberch trained a lot with the first team, even during preparations for the huge game vs. PSV. A day before the game, he was called up by Ten Hag for the first team squad. And it only got better, because he made his official first team debut, which gave Ryan an important place in Ajax history already since he is now the youngest player to ever play for Ajax. An absolutely incredible moment, mostly for himself. “My biggest dream and plan for the future? I want to reach the first team in two years”, said he exactly one year ago during an interview with Ajax.nl. At the time of writing, we realize how special this moment is. In November 1992, Clarence Seedorf broke the record with an age of 16 years and 7 months. At his debut he was 4 months younger than Richard Sneekes (16 years, 11 months). This record was set in October 1985, which shows how unique this moment was. Gravenberch’s debut broke a record that was almost 26 years old record. “It was great, really great. The result was a pity, of course, but I am very happy with my debut. (…) I am the youngest Ajax debutant now. That is something I am very proud of, Clarence Seedorf had the record for over 20 years. Despite everything [the result], I am very happy with my debut. Yes, I was nervous, haha! I will keep this shirt and frame it”, said Gravenberch after his debut [Ajax TV, September 2018]. It is and should not be a goal to break such an achievement, but it is a wonderful and rare accomplishment for Ryan. He has fully deserved it with his impressing development over the last few years. There is a chance that Gravenberch will start for the first time on Wednesday, in the cup fixture versus Te Werve.